The small thyroid gland in the lower throat near the base of the neck secretes hormones to regulate body metabolism. A thyroid hormone functional deficiency, hypothyroidism, can disrupt or even stop such metabolic processes. This article takes a look at hypothyroidism; the most common symptoms, signs and treatments that are proven to work. Hypothyroidism often develops gradually and sometimes takes years to present discernible symptoms. Females in their 50s and older are more likely than males to have hypothyroidism, but adolescents and small children also may be susceptible. Typical signs are weakness and fatigue, unintended weight gain, dry, rough skin, hair loss, dry, brittle nails, hypersensitivity to cold, constipation, depressed mood, irritability, faulty memory, abnormally heavy menstruation, and low libido. If untreated, hypothyroidism may produce very dry skin, facial swelling, low blood pressure, abnormally low body temperature, dulled sensory perceptions, and shallow respiration, even coma. Fortunately, such severely advanced hypothyroidism is infrequent. In economically and socially underdeveloped countries, insufficient dietary iodine causes most cases of hypothyroidism. Iodine is a necessary component of two main thyroid hormones. In the United States (US or USA), where salt is iodized so more than enough iodine is available, Hashimoto’s thyroiditis, an autoimmune condition that inflames and destroys thyroid tissue, interferes with thyroid hormone production. The exact cause of the Hashimoto’s condition is unclear. Less common cases of hypothyroidism involve congenital defects and pregnancy. Some women during or immediately following pregnancy develop antibodies against their own thyroid tissue. This dangerous development can lead to miscarriages, developmental abnormalities, premature deliveries, and high risks of preeclampsia, a form of toxemia of pregnancy. Some foods, especially Brussels sprouts, broccoli, cabbage, cauliflower, corn, kale, lima beans, soy, and sweet potatoes, contain compounds that can enlarge the gland by interference with hormone syntheses. Some health care providers advise hypothyroid patients to avoid these foods. Most physicians diagnose hypothyroidism by blood tests for levels of the thyroid-stimulating hormone made by the pituitary gland in response to body needs. As thyroid hormone levels fall, the pituitary stimulates the thyroid to produce more. Clinicians also may measure circulation levels of the thyroid hormones themselves. Low thyroid hormone and high thyroid-stimulating hormone levels indicate an underactive thyroid. Other hypothyroid variants may be present. Patients may be asymptomatic with normal serum thyroid hormone but elevated thyroid-stimulating hormone levels. Others may present symptoms with normal thyroid hormone and thyroid-stimulating hormone levels. Patients with temporary illnesses may have completely normal thyroid but high thyroid-stimulating hormone levels, a condition that usually resolves without intervention. Hypothyroidism treatment aims to maintain normal metabolism. When treatment is by conventional replacement therapy, however, the thyroid gland ceases hormone production altogether, and replacement must continue for life. Most conventional physicians prescribe Synthroid, a synthetic thyroid hormone, and monitor dosage by symptoms and thyroid-stimulating hormone levels. They use particular caution with patients with cardiovascular disorders to allow their hearts time for adjustment to a metabolic rate artificially increased. Side effects of too much synthetic thyroid hormone are agitation, palpitations, and insomnia. Dietary: Conventional physicians tend to respond to regular consumption of soy with increased dosage of replacement therapy medication. They suggest that soy consumption within three hours before administration of the medication may interfere with its absorption. Adequate dietary iodine intake from iodized salt, fresh ocean fish, and seaweed, they say, is also important. Exercise: Many hypothyroid patients report benefits from yoga, which increases circulation to the thyroid. Conventional thyroid treatment regimens do not emphasize exercise. A hypothyroid body no longer can produce adequate amounts of vital hormones. The conventional, prevailing medical establishment view is that hypothyroidism is yet another autoimmune disease, ignoring truly probable causes, though the immune system attacks only what it detects as toxic. An ingredient of most processed foods, soy, which conventional endocrinologists downplay as a threat to the thyroid gland, is in fact a thyroid suppressant. Fluoride, also damaging to the thyroid, was until recently a conventional treatment for hyperthyroidism. Fluoride intake continues with consumption of tap water, toothpaste, processed cereals, and sodas and use of nonstick cookware. Hypothyroidism is also a side effect of lithium, a medication for bipolar psychiatric disorders. All selective serotonin reuptake inhibitor (SSRI) anti-depressant drugs feature some fluoride compound as a primary ingredient, so these psychotropic drugs contribute dramatically to thyroid disorders, in some cases as the primary cause of hypothyroidism. SSRI drugs are infamous for nutritional deficiency side effects because they disrupt the role of serotonin in digestion. 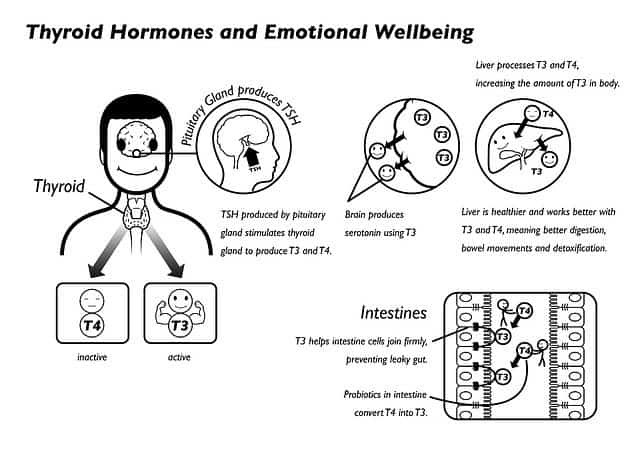 Contrary to pharmaceutical marketing claims, the digestive system, not the brain, utilizes most serotonin. 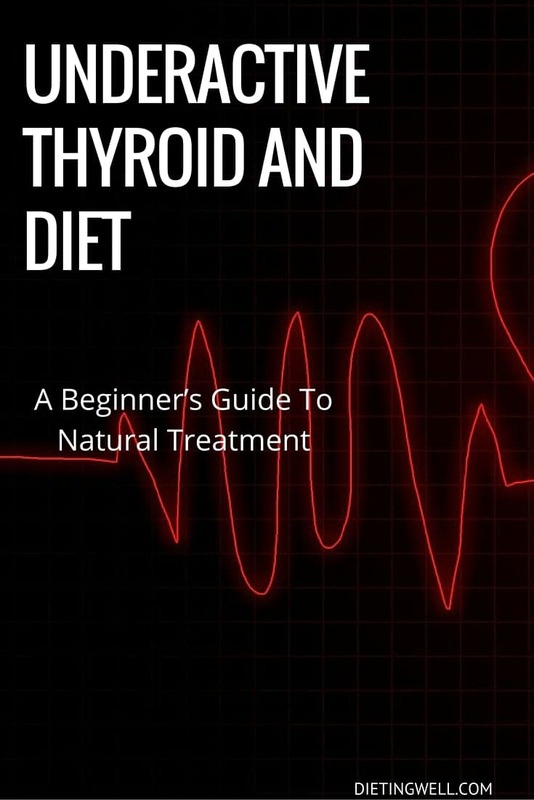 Without proper nutrition necessary to balance hormones and to keep the thyroid gland vigorous, there can be no curative treatment for hypothyroidism. SSRI drugs reduce usable calcium amounts in the body, rendering magnesium, which is interdependent with calcium, unusable. Magnesium deficiencies are plentiful in contemporary American society due to insufficient consumption of green leafy vegetables. Hypothyroid patients are more likely than others to have cardiac problems for lack of the hormones that keep heart contractions strong and regulate heartbeat rhythm. The medical establishment prescribes for hypothyroidism synthetic hormone pills that patients must continue to take as long as they live. Synthetic hormones cause the thyroid gland to stop producing natural hormones, an effect similar to that of synthetic insulin on the pancreas. In either case, the medication actually does not strengthen the gland, as the patient would hope and expect, but weakens and makes it dysfunctional. With conventionally wise physicians, there is no cure, just perpetual, ineffective, and expensive replacement treatment. Unreliable conventional medical tests for hypothyroidism can return inconsistent and conflicting results; consequently, some patients remain drugged indefinitely for a condition they did not have until their hypothyroid treatment began. Their hypothyroidism is more difficult to cure than are cases of those who do nothing at all or who turn to alternate treatments. The US Food and Drug Administration (FDA) Center for Drug Evaluation and Research Ombudsman annual report for 2009 noted under the heading “Most Common Contact Topics from Consumers, Advocacy Groups, and Health Care Professionals” that “Desiccated natural thyroid does not have FDA approval and its availability became quite limited in 2009. Use of natural hormones from animal sources to treat hypothyroidism began in the last decade of the 19th Century. The first synthetic thyroid hormones appeared in 1958 marketed as identical to the natural hormones that had been in use for several decades. Then the FDA indirectly suppressed use of the safer, natural hormones for no apparent reason other than to make the pharmaceutical industry more profitable. Synthesized chemical compounds are patentable; natural substances are not. The FDA did not ban natural hormones but achieved the same result by re-categorizing them as therapies “not approved” for treating patients, and doctors may risk their medical licenses and exposure to lawsuits by prescribing them. FDA critics contend that the re-categorization of natural hormones is an abuse of authority to eliminate competition for favored pharmaceutical manufacturers. Synthetic hormones are more expensive and less safe than are the natural and display the same pattern of addiction encountered in cholesterol, diabetes, and anti-depressant medications. Treatment of both hypo- and hyperthyroidism should further thyroid healing. Hyperthyroid patients should not use iodine as it might overstimulate the gland and aggravate the condition. A true cure for a thyroid disorder demands a commitment of at least a year. The problem takes years to develop, so there is no quick, easy fix. Patients who have taken addictive hypothyroidism medications for years must wean themselves away from them. Abrupt withdrawal causes disabling fatigue and additional thyroid problems. Consume no soy. Soy can suppress thyroid functions, upset hormone balances, and cause goiter enlargements of the gland. Maintain an alkaline, not an acidic, diet. This recommendation is part of the treatment of any chronic disease. Balance estrogen levels. Excess estrogen inhibits thyroid activity. Discontinue use of contraceptive medications, increase consumption of dietary fiber, and avoid processed meats. Growth hormones in meats cause hormone imbalance. Drink less milk, which contains substantial amounts of estrogen. Exercise. Find an enjoyable physical activity and engage in it regularly. No cure time is possible without regular, vigorous exercise. L-Tyrosine. Tyrosine, a natural amino acid essential to thyroid hormone production, is an ameliorative treatment for the depression that accompanies hypothyroidism. L-Arginine. Arginine stimulates thyroid hormone production, improves immune function and fertility, and repairs erectile dysfunction. Iodine. The thyroid needs iodine for full and proper function, but iodine deficiencies are frequent in the current population. Test for deficiency by placing a 2-percent tincture of iodine the size of a dollar coin on the stomach. Disappearance within 12 hours indicates deficiency manifested by the rapid transdermal absorption. Red marine alga is the only safe oral iodine supplement, and baked fish is the best natural food source. Avoid all sources of fluoride. Fluoride, which suppresses thyroid hormone production, is a common cause of hypothyroidism. Drink spring water, do not drink tap water or sodas, use no-fluoride toothpaste, and discard all nonstick cookware. Tea and coffee contain fluoride, so drink them sparingly if at all. Eat natural foods. To help the body heal, do not burden the immune system. Remove all processed foods, artificial colors and flavors, chemical preservatives, white flour, sugar, table salt, and hydrogenated oils from the diet. Organic foods are best. Do not accept “All Natural” labelling at face value; this unregulated phrase is for any marketer for any purpose. Chlorophyll. Chlorophyll oxygenates the body, builds healthy red corpuscles, and contributes to healthy skin. Chlorophyll is a safe means of oral copper supplementation. Users of colloidal copper lotion probably need no additional copper. Eat Plenty of Pears and Apples. Pears tend to balance female hormones, especially together with apples. Zinc and Selenium. Zinc or selenium deficiencies can lower thyroid hormone levels. Zinc can be harmful if swallowed on an empty stomach. Brazil nuts contain high amounts of both elements. Coconut Oil. Take a teaspoon of organic, cold-pressed, coconut oil every day. As a cooking oil it smokes easily so should be used at low temperatures. Coconut oil accelerates metabolism, encourages thyroid hormone production, and kills candida yeast. Avoid Canola Oil. Along with several other dangers, canola oil interferes with thyroid hormone production. Treat canola oil like a genetically-engineered toxin, which it is. For chronic constipation, add fiber to the diet. Flax seed oil combined with sulfur proteins in yogurt, for example, can decrease inflammation, increase oxygenation, stimulate growth of beneficial intestinal flora, and act as a mild laxative. There is considerable controversy over the application of iodine to treat Hashimoto’s thyroiditis. Dosage is important as an overdose can shut the thyroid down, but a small dose can be helpful. There is no evidence of harm to those who apply iodine transdermally and moderately. Iodine on the skin allows regulation of the absorption rate. Chlorinated and fluoridated water and brominated flour are common sources of hypothyroidism. Chlorine, fluorine, and bromine are all halogen elements in the same chemical family as iodine, which they can displace in the thyroid gland, and in any event too many people fail to get enough iodine from their diets. Hypothyroidism also relates to elevated reverse thyroid hormone levels which return to normal after chelation, which removes heavy metals from the bloodstream, where the presence of lead and cadmium interferes with hormone production. In Japan, the average daily dietary dose of iodine is two to three milligrams, an amount healthier for the thyroid than is the US Government recommended daily allowance of 150 micrograms, and some dieticians recommend as much as 12.5 milligrams daily. Seaweed or kelp is an abundant source of iodine available either powdered or in capsules. Its mild, salty flavor makes it a good spice for seasoning. Radiation from the Fukushima reactor has contaminated Japanese seaweed, so try to get it from as far away from Japan as possible, Norway, for example. First, a physical exam looks for dry skin, thinning of the eyebrow margins, edematous fluid in the ankles, lack of perspiration, excess body weight, and a high cholesterol level. The complete thyroid panel of laboratory tests is for thyroid-stimulating hormone and for total, free, and reverse thyroid hormone levels. The thyroid-stimulating hormone test, the primary diagnostic device of conventional practitioners, in fact rarely reflects the patient’s actual condition. Only when abnormally high is the thyroid-stimulating hormone level a diagnostically reliable determinant of hypothyroidism. The practice of thyroid therapy dates from the 1890s, and until the emphasis on the thyroid-stimulating hormone test, the average hormonal dose was about double what it became when the lab test rather than the clinical signs became paramount for conventional diagnosticians. Natural medicine practitioners base their diagnoses on the physical exam and the free hormonal level. The free, active hormone is the one that generates energy. One way to distinguish natural medicine from traditional, conventional practice is by the type of thyroid replacement therapy. Most hypothyroid patients on thyroid hormone replacement therapy receive the synthetic Synthroid or Levothroid, which traditionalists always prescribe; whoever does not often endures harsh criticism, even a summons to appear before the state medical disciplinary board to defend their decisions to prescribe whole, natural thyroid hormone instead. Whole, natural hormones are best unless the patient has an autoimmune problem. Hashimoto patients, who make antibodies to thyroid, may not tolerate whole thyroid hormones from the outset of treatment because they may stimulate formation of more antibodies. Treatment for these patients should proceed instead in graduated stages. A major cause of hypothyroidism is by elevated reverse hormone levels that rise in response to heavy metal toxicity. In such cases, detoxification as variable as the levels of lead, cadmium, mercury, and other heavy metals present should precede thyroid treatment. Some patients purge themselves of these toxins efficiently within 10 to 15 chelation treatments. Others take 30 to 40 treatments to eliminate all toxic metals. But along with the toxic metals chelation extracts the wholesome varieties normally present, calcium, magnesium, zinc, and copper, and necessary for health. The chelators must reinfuse the latter normal metals periodically during the process. While removing these toxic metals to lower the reverse hormone levels, should the physician treat the patient with thyroid medication? Opinions divide on this question. Some say add regular thyroid hormone, but, if chelation lowers the reverse hormone level, the net end result may be too much free hormone. Others say wait until after the chelation, reevaluate, and, if necessary, administer whole thyroid hormone if there is no Hashimoto condition nor family history of autoimmune disease. Clearly, this process needs a trusted and respected health care clinician to perform these tests and procedures and to prescribe the best supplements and thyroid hormone replacements not available over the counter. Removal of carbon-based toxins can be by profuse, sauna-induced perspiration. The Hubbard Protocol uses niacin, intense physical exertion, and sauna to excrete toxins. Perspiration is not effective for toxic metals, which need the more aggressive method of chelation. Chelating suppositories can limit the loss of essential metals. They present no reason for alarm over malnutrition, which is a concern about any chelation agent taken orally. One drawback to Armour Thyroid is its higher cost, usually double that the other two. If cost is no object, several tests for compatibility can determine which of the three would be best for the patient. Compatibility testing checks energy flow and how each choice might impair it. Physicians recommend the one most compatible but defer to patient concerns about relative costs. As for dosage, various symptoms suggest the (in)sufficiency of a dose or whether the condition actually presents a thyroid problem. Two key symptoms that signal too much are unusually excessive perspiration and rapid heart palpitations. Either of these symptoms means too much thyroid medication and a need to reduce the dosage. In some cases of borderline hypothyroidism, an iodine supplement may suffice rather than an unnecessary thyroid hormone replacement therapy. At the opposite end of the range of thyroid disorders is hyperthyroidism, thyroid overactivity. It’s far less frequent than is hypothyroidism but not a less serious disorder. Typical conventional treatments are by radioactive iodine or surgery. In a 1984 study of hyperthyroid treatments, the Walter Reed Army Medical Center divided hyperthyroidism patients into four treatment groups. One group received lithium, the second iodine, the third lithium first and later iodine, and the fourth iodine first and later lithium. 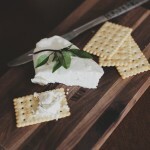 The study found that the fourth group that started with iodine and finished with lithium did much better than did the others in getting its hyperthyroidism under control. In a later article on treatment of hyperthyroidism with lithium alone, the Mayo Clinic reported an ability to reduce abnormally high hormone levels to normal within several days. The lithium treatment was not so effective with every patient treated, however. The extent of hypothyroid prevalence is greater than the medical profession once believed. Some experts say from 10 and 40 percent of Americans have some lack of thyroid function. Cells of all body tissues make constant use of thyroid hormones to regulate metabolism and control their oxidation of carbohydrates and fats for energy. Thyroid hormones are indispensable to all cerebral functions and to the growth and development of children. Feelings of sluggishness and fatigue, difficulty in maintaining normal weight, dry skin, hair loss, constipation, and inability to tolerate cold or to perspire all could be clues to undiagnosed hypothyroidism. Iodine is the sine qua non to a healthy thyroid gland, and, if the diet fails to supply enough in the form of seafood, consider a dietary supplement of high-quality seaweed, kelp, red marine algae, or another good source of iodine. Good sound advice. I’ve long been a believer that processed foods are dangerous to our bodies for many reasons. When I was diagnosed with Hyperthyroidism a few years ago I started reading everything I could and my doctor gave me a list of what to stay away from. Weaning yourself away from sugar and convenient foods is tough in fact that’s been my hardest hurdle.